Volunteering overseas is increasingly popular and it is easy to see why. Not only do you get to experience life in a totally new place but you are also able to contribute to a really worthwhile project too. Deciding where to go can be the biggest challenge – especially when there are so many incredible options to choose from – so we have put together our top 13 most unusual and, of course, fantastic places to volunteer abroad. Namibia – when we talk to people about volunteering in Nambia the first comment is usually ‘Where is it? I have never heard of it’. Nambia borders South Africa and is one of Africa’s youngest countries. It is also incredibly beautiful, sparsely populated and intriguing to visit, making it a fantastic place to travel to. With the world’s only desert elephants and Swakopmund – home of adrenaline sports – this is paradise for lovers of the great outdoors. Borneo – home to the ‘king of the swingers’, one of the world’s most curious creatures, Borneo is an exceptional place to volunteer. Typically popular with graduates, it is now starting to attract the younger gap year crowd who are discovering all that this wonderful island has to offer. Sri Lanka – slowly making its way onto the tourist radar, Sri Lanka is not only a beautiful country, but also a fantastic place to volunteer. Volunteering in Sri Lanka will undoubtedly feel like an adventure and the people you meet will almost certainly be some of the friendliest you will ever come across. Packed with history, culture and incredible wildlife, there is a lot to discover. Burma – having been closed for many years, Burma recently opened to tourists once more. Burma is a really unusual place to explore, because it still relatively tourist free. Spend some time volunteering in this fascinating opportunity to live in and learn about Burma first-hand. Teaching English to monks is a really popular option. Australia – a firm favourite on the tourist trail, but somewhere that people don’t always think of when deciding to volunteer. With diverse landscapes and a sensitive ecosystem, it makes for a fascinating experience. Not to forget, it is also one of the most fun locations on the planet for intrepid travellers. Romania – Europe is often overlooked by those looking to volunteer, but there are lots of different options available in wonderful Romania. For example, you can volunteer with children, animals or join a medical internship. Nepal – following the earthquake devastated the country, volunteering in Nepal is increasingly important. Nepal is encouraging visitors to return so what better time to discover this beautiful country and volunteer whilst you are there. 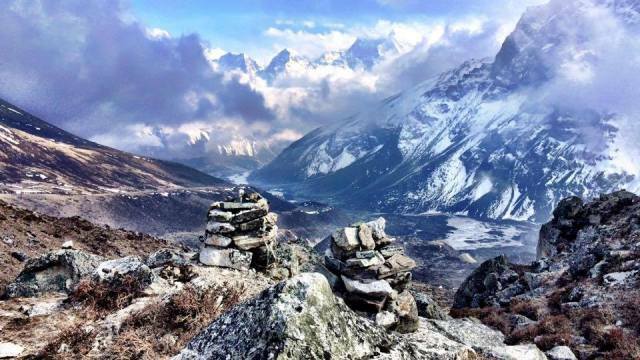 Home to the Himilayas, Nepal has some amazing treks and unparalleled scenery. The Arctic – freezing cold and home to the polar bear, could anywhere be as unusual a volunteer destination as the Arctic? Wrap up warm and get involved in a conservation programme. It will certainly be an experience of a lifetime. Chile – with hugely varying landscapes, incredible views and hospitable people, Chile is an unusual, but incredible place to volunteer. Teach English and learn Spanish in return or become a conservation volunteer against the most stunning backdrop. Iceland – often considered an expensive place to visit, but one with enough natural beauty to tempt even the thriftiest of travelers. Volunteering in Iceland is the perfect way to explore the incredible country on a budget. Brazil – one of the world’s most vibrant and colourful countries. Now is an incredible time to visit Brazil. After the success of the World Cup and the Olympic games, there are few more exciting places to visit than Brazil. Home to many of the world’s most famous sport stars, incredibly, children do not have access to sport in their day-to-day education. Cuba – another place that has recently opened up to tourists, Cuba is another excellent place to volunteer and you will be able to brush up on your Spanish whilst you are there too. Mongolia – often conjuring images of far-flung lands, Mongolia is the last place on our list of alternative places to volunteer. Beautiful and well of the beaten track this is a fantastic option for those looking to volunteer somewhere a little unusual. If you have any ideas of other unusual or intriguing places to volunteer then let us know. If this has sparked your interest in volunteering, why not check out the different quirky options that we have on offer here. Previous Post Top tips to combat jet lag! They sound like amazing places and would be thrilled to be a Volunteer.